Congratulations you have been selected to participate in the 2019 Arrowhead 135 - 135 Miler! What have I done? Now I have to prepare for and participate in this ride with the intention of actually finishing. Don’t lose your valve core! My strategy: keep riding at a low enough output that I could ride indefinitely. I learned in training and shakedown rides that I’d burn through my energy reserves much faster on this 135 miles than I had on any other 100 mile ride in the past. The snow and tires just eat wattage like it’s going out of style so the pace is slower and harder. I also have a bum knee and I knew that ibuprofen alone wasn’t going to keep it working for that amount of time on a bike. Not only would I have to be constantly aware of my leg position, but I’d have to make sure I wasn’t overexerting my damaged joint. On the day before the race, I rode out a few miles on the trail to check conditions. The trail was cold and hard, so I added pressure to my tires to reduce rolling resistance. I also found that my toes got cold below -26F still, so I knew I’d have to keep on top of that with hand warmers. At the pre-race meeting/dinner, some other racers convinced me to use a vapor barrier to keep my outer sock and boot dry. I decided on a thinner baselayer merino sock, a plastic bag, and a thicker outer merino sock. 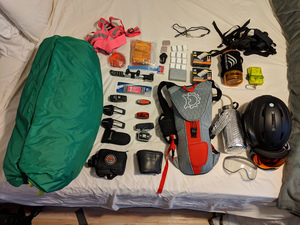 I’m not one to make a last-minute gear change (see ride report takeaways above) but I’m glad I did. 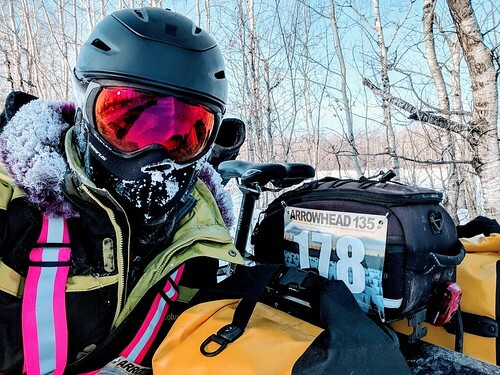 On the morning of the race, I rode over to the start line at about -30F and checked in. The fireworks went off (way bigger than I expected from videos I had seen) and we all started lumbering forward, some much faster than others. After 4 miles, my goggles were uselessly frosted over, so I secured them to my bike and put sports tape on my face since I forgot the facetape I bought specifically for this event. After 8 miles, I stopped at the shelter at the corner of the Blue Ox and Arrowhead trails to add hand warmers to my boots and have breakfast. 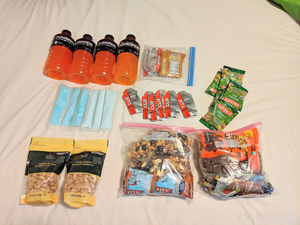 I hadn’t managed to have enough time to eat before the race start, which was a mistake but not an insurmountable one as I had a pocket full of leftover chicken tenders from our takeout dinner from the Chocolate Moose restaurant the night before. I have to say that fried chicken with ice crystals is a weird texture; the first two were much tastier than the second two. The hour after sunrise is always the coldest and after breakfast, the temps started to rise for the day. About 15 miles in, the trail conditions shifted from hard packed to soft and squirrelly and the track made by other bikes became a narrow safe line with quicksand on either side. I wanted more control and float, but I didn’t want to increase rolling resistance much for such a long race. 5 seconds of air out of the front tire and I was a little more stable over the soft stuff. The soft snow continued for another 5 miles, which took me an hour to cover, then hardened back up with a clear path where other tires had left their mark. A little after 14:00, I crossed a road that felt like it was large enough to be the one where Gateway and checkpoint 1 was, but I didn’t see any indication that I was supposed to turn. I stopped and checked my phone and sure enough, it was the right road! 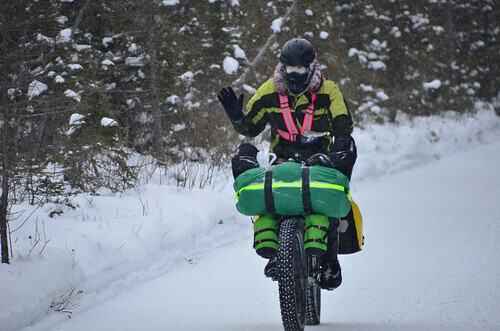 I rode back and turned south to head down to Gateway and was reassured by the sight of several other fat bikes and people greeting racers as they arrived. Inside, I checked in at 14:20, answered that no, I didn’t think I had any frostbite, and looked around at what was available to maintain myself. A few other racers, including KariAnn Gibbons, who did a double Arrowhead on foot the year before, were stripping off their outer layers and letting them dry in the warm air coming out from under the freezer section’s coolers, so I did the same with my top two layers and checked on my makeshift Holiday bag vapor barrier. My hand warmers were still warm, so I swapped base-layer socks, made sure everything was in place and put my boots back on. Hydration...I knew I needed to keep up on that, so I wandered around the store and found that everything listed as available at this checkpoint was indeed available, but none of it was provided. I bought 2 quarts of gatorade and a bratwurst, topped off my hydration pack, and put my slightly drier clothing back on. At 14:55 I headed out. 35 miles in 8 hours was slow, but not unexpectedly so given it was the hardest 35 miles of biking I’d ever done. Only another 35 miles to MelGeorges, so I should be there by...11? I headed back up the road to the Arrowhead trail, turned right and followed the turn markers at the next junction. In the distance, I saw a gas station that looked suspiciously like the one I had just left. What happened? Oh! The trail does go here, I just had to keep following it instead of second-guessing. Time to turn around and follow the next set of turn markers to continue onward to checkpoint 2. After Gateway, the hills start. I remember reading a race report by Joel “sweet beef” Swenson that described Wakemup hill as “I was told I’d know when I reached it because I’d come around a corner, see it, and utter some sort of expletive” well...every hill made me utter some sort of expletive and they just kept on coming. I’m not a hill climber at all; most of my riding is on flat rails-to-trails style paved paths with no real challenge. These hills, on the other hand, were often as steep as 80% both up one side and down the other. I was dragging my breaks on the way down, then hopping off and hiking my bike up the next hill. Just multiply that by 35 miles and you’ve pretty much got it. Then remember it got dark when the sun set at 17:00. One thing I started to get good at was finding the safe trail down the hill so I could let off my breaks and ride it out. I was also happy to find my footprints weren’t always the lowest on the uphills. Somewhere on the trail, I met with another biker who was having tire problems. I helped out by holding his bike while he tried to inflate it with a hand pump, then gave up and used a CO2 inflator. It was a tubeless tire that must have burped off the bead and not re-seated properly so he was really worried he wouldn’t make it to the next stop. The CO2 seemed to reseat the bead, so we parted ways and I hoped he would make it. It was a long way to walk from here. KariAnn told me at Gateway that there was a sign reading “MelGeorges 5 miles” that lied, so I ignored that and continued on. When I got to Elephant Lake, the wind picked up a bit, but it was the flattest section I’d seen in hours. I had been looking up at the stars through the trees, keeping a general Idea of which direction I was going by where Orion was in the sky. On the lake, there were no trees to obstruct my view and I was overwhelmed. I haven’t seen that many stars in a long time. So I stopped in the middle of the lake, turned off my headlight, and just stared up for a few minutes enjoying the view. -20 degrees wasn’t going to keep me from a little stargazing. Eventually, I reached the other side of the lake and pulled up on the shore. The main resort building and restaurant was to my left (and I was tempted to stop for a full meal inside) but checkpoint 2 lay somewhere to my right. I started down that trail and luckily KariAnn came up behind me and actually knew where we were headed. I followed her in and checked into the lodge at 23:28, a little behind schedule after the hardest 35 miles of biking I’d ever done. Everyone at CP2 was great. Grilled cheese sandwiches, hot wild rice soup, cookies, chocolate milk, hot chocolate, coke...everything you could possibly want plus running water, a fire, and a place to dry out my mittens. Other racers came and went, or came and stayed. Runners ate and kept going, a skier decided to drop to protect their knee. KariAnn was family with the people volunteering and decided to nap for a few hours. I rested and I debated my plan for the rest of the race. 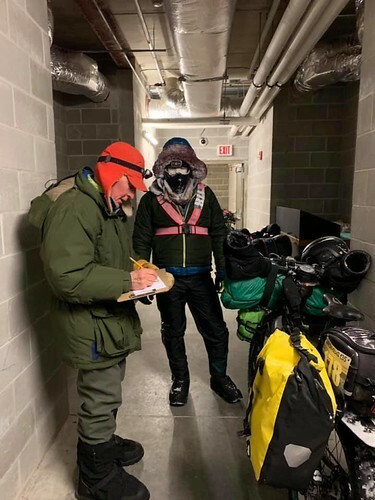 It was after midnight and getting colder, but I knew the temperatures Tuesday night and into Wednesday were going to plummet into the danger zone. -40 was something I was theoretically prepared for, but not sure I really wanted to deal with. My speed had been less than the 5 MPH I had hoped for and if I left now, I might just get to the finish by sunset. 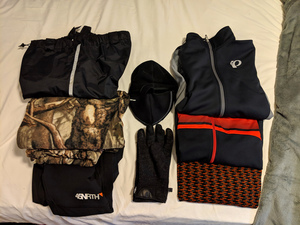 So the volunteers refilled my hydration pack and melted the slushy gatorade out of my back-up water bottle, I layered back up with some of my clothing still slightly damp from condensation, and headed back out into the night at 02:09 for the 40 miles to checkpoint 3. Should get there at 14:00 maybe? 12 hours should be enough time even at my snail’s pace. Unfortunately, my Garmin InReach Mini GPS tracker had died in the cold outside the checkpoint. 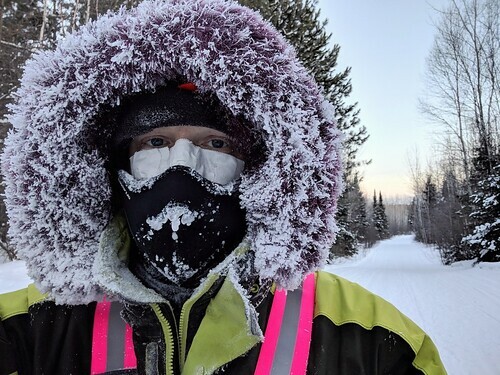 I was pretty sure it had just turned off due to “extreme cold” temperatures, so I tucked it into my jacket to warm it back up enough to power on at the next intersection 2-3 miles down the trail. Good enough to get it started again. I made a mental note to figure out a better way to manage that thing in winter. The trail was still beautiful and the sky was still clear and bright with stars. The hills came back with a vengeance and I was hiking up bigger and longer hills, some of which were extra sneaky and continued after turns. I was feeling more confident rolling down with less brake than before, but still braking hard on the steepest downhills to reduce my fear of a race-ending crash. The temperature continued to drop over night and the trail was just a series of hills in the cold darkness. At some point in the morning, I realized I couldn’t close the vents on my helmet because they were frozen, so I switched to a hat and hood with my ruff pulled up to block wind and attached my helmet to the front of my bike once I realized my pogie was about the same size as my neck. When sunrise came, it was bitter cold again. At least -30 by the thermometer on my bike. I was glad I changed the handwarmers in my boots at MelGeorges even though they were still warm, but I was starting to feel the cold penetrating my upper layers. I decided to stop and add a layer under my shell just for a couple hours until it started to warm back up again. That’s when things went wrong for me. My jacket wouldn’t come off over my gloves, so I took them off; both layers. I put on my new layer and slipped my shell back on, but my gloves had frozen solid in the few seconds that took and I had a hard time getting them back on. I managed to get my fingerless bike gloves on, but my left pinky was so cold it was numb in only a few more seconds. I threw my left merino over-glove into my right pogie with my fully-gloved right hand to try to thaw it while tucking my left hand as far under my armpit as possible. I couldn’t feel my hand getting warmer so I thought about the next most accessible warm place on my body and shoved my left hand down my pants and between my legs, over my bib but under my fleece. In a few minutes I was able to feel my pinky again and my glove was soft enough to put on. Job done. As one of the bikers I had chatted with at MelGeorges caught up with me, they asked if I was ok. I said that yes, I was fine, I just had a series of unfortunate events. At this point I was just mucking with my bib number and they told me that sounded like a really trivial problem, which I agreed with and explained my failing zipper. They seemed satisfied that I had everything under control and wasn’t deliriously hypothermic and continued on. Swap my Namakan Fur ruff to my new outer jacket and it’s time to move on. I decided there must be no end to the hills and there was no way I was going to be able to continue past checkpoint 3/Surly/Sky Pulk unless there were no more hills. Even one hill was going to kill me at this point. But the trail was opening up a bit to fields and slightly fewer hills already. That meant more wind, but it also meant I could actually use my bicycle as something to support my weight and act as a sort of conveyance rather than just a means of transporting all my gear as I hiked beside it. Around the corner, I saw smoke. Was that it? Was that the teepee? It was! Finally! I sat down by the fire and considered my options. I could refill my hydration pack, but that was a lot of work and I was pretty sure I had 25 miles worth of liquid in it. I cracked open my spare supply and was happy to discover it was still liquid, so I drank 1L of gatorade by the fire. I asked about what was coming up on the trail and they said “there are a few rollers, then one really big hill, then one really big downhill, then it’s mostly flat.” That doesn’t sound too bad. I asked what time I checked in; 14:37. Wait, only 14:37? I’m not hours behind schedule? I can do this! Jodi came by and greeted me and encouraged me. I was obviously in quite the state and our dog was still sitting in the car, so it wasn’t much of a conversation. She took a few pictures of the heroic adventurer (me) and I mostly just sat there drinking my gatorade until it was gone, being careful not to close the lid or touch the bottle with my lips because any liquid I dripped onto it was immediately freezing to the threads. I don’t know why I didn’t go into the teepee and refill my water bottle with hot water or check my boots and socks or have a shot of whiskey. There was a frozen bottle of whisky outside on the table that might have scared me off. After my shortest stop yet, I walked my bike up the short incline after the checkpoint at 14:58 and rolled off down the first of the rollers. Wakemup mountain, after all the other hills on this course, is at least not the steepest, but it is certainly the tallest and the longest. I don’t know how long it took me to get to the top, but it felt like forever. The view was totally worth it though. I considered stopping to take a picture and I probably should have, but I didn’t feel like dealing with...anything really, at the moment and continued onward. After a harrowing downhill on the other side of Wakemup, I was on the false flat 1% uphill grade through the lowlands and on the final stretch to Fortune Bay. The wind picked up and I started to hope I’d be staying in the trees because the sun was going down and it was going to get bitter cold again. I honestly don’t remember much of this stretch. I remember wetlands and trees and tall grasses all covered in snow and ice. I remember a small bridge with such a big snowdrift in front of it that I preemptively got off my bike and shoved it through lest my rear wheel get sidetracked and throw me to the ground. I remember the sun going down, but not in any detailed way. And yes, I remember it getting colder. Tuesday’s low was supposed to be brutal and there were forecasts of wind chills in excess of -55 for Wednesday. I kept an occasional eye on my thermometer and watched as the temperature slowly dropped. Hours later and with hours to go, the temperature passed that magic mark between -26 and -27; my toes started to get cold. I regretted neglecting to check on my socks at Surly I guess because my handwarmers had still been warm at Melgeorges after over 15 hours of riding. That was not the correct decision to make. There was a light breeze, but it felt like a blast chiller at these temperatures and it was flowing directly down the trail between the tall pines. 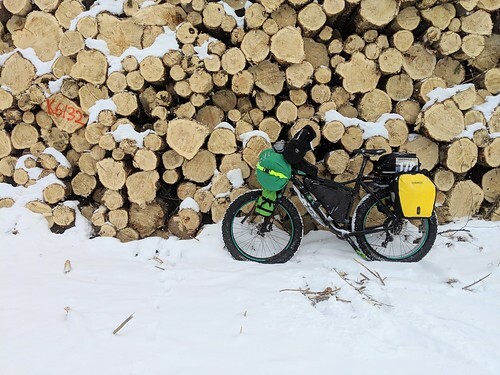 I knew I needed to deal with my boots, so I got off my bike and laid it on the trail at an angle where the bedroll on the handlebars could act as a mediocre wind block and started to attend to keeping my feet warm. I knew I would have very limited time to have my boots off, so I made sure I had two opened and shaken hand warmers ready before sitting down in the snow and taking off my left boot. Then I discovered I definitely should have taken care of this at Surly in a shelter rather than out here on the plains. The plastic bag I was using as a vapor barrier had slid down my leg and half of my foot, meaning my outer sock had a chance to get wetter than I’d like and therefore less insulating. I hadn’t grabbed a change of socks before sitting down to take off my boot, and my outer sock was wool, so it had a better than average chance of staying warm despite the moisture. I rearranged everything and replaced the no-longer-warm hand warmer. When I put my boot back on, it had stiffened up significantly in the cold...or I had...either way, it was harder than it should have been to put on. I made the call to only deal with my left foot since that was the one likely to get cold, put the second handwarmer in my pocket, and got back on my bike. My energy was sapping and I had no idea how far I’d gone. My GPS tracker was only checking in every 10 minutes to save battery so with the twists and turns the distance it showed me didn’t seem to match with the distance I knew I had gone. On top of that, I’d been having a terrible time trying to keep it warm enough to run and needed to tuck it under my jacket to warm it back up nearly every time I took my hand out of the pogie where I was storing it for any extended period, like the time it takes to put a hand warmer in my sock. That meant the distance it showed was from some arbitrary location on the trail and wasn’t useful at all. I knew it didn’t really matter how far I had to go because it was the same distance from start to finish no matter where I was now. The hours of being awake were taking their toll and I felt like I was going to fall asleep riding. Luckily, it turns out clif shots are not solid at -30 and slightly softer if you put them in a pocket with a hand warmer for a couple hours, so over the course of the final miles, I downed 3 of them trying to stay awake enough to keep upright and have enough energy to keep pedaling. My strategy of drinking the last of my reserve gatorade at Surly and leaving my hydration pack as it was for the last leg also worked well as I continued to have warm-ish gatorade that provided a few ready calories. The driver of a snowmobile yells out “2.6 miles left!” Probably the longest 2.6 miles I’ve ever ridden even though I’m pretty sure it was less than that. For what had seemed like the last few hours, I saw the glow of lights on the horizon that pretty much had to be the casino. They kept moving back and forth as the trail twisted its way across the plane, but they never seemed to get closer. Suddenly a bright orange snow fence I remembered reading about in people’s race reports appeared and then the trail had a bright light at the end with a big flag that said “finish” on it. As I got closer, I realized I wasn’t going to be able to cross the finish line riding my bike because the tiny 10’ hill in front of it was just not something I could climb at this point. As I got still closer, I could hear hooting and hollering and cowbells. They continued for what felt like minutes as I made my way to the finish line. I thanked everyone for their patient exuberance and one of them said “you have to actually cross the finish! Keep going another 3 feet” or something to that effect. In the hospitality room, I picked out my trophy (with a nice black, burnt-looking arrowhead) and got my photo taken in front of the sign. I sat down and stared into space for a bit. I answered the post-race follow-up questions for the sports nutrition study Jonathan Erber was doing but I hadn’t taken any notes while eating so my answers probably weren’t as accurate as they could be. I ate a bowl of chicken soup he got for me, which turned out not to be what I wanted. Then he said someone who won in the past, Jay Petervary I think, always had tomato soup with Doritos and it sounded way better than I expected. I tested by dipping a chip in the tomato soup and the combination was ok, so I crushed a double handful of chips into my bowl and mixed them in. That ratio turned out to be much better and exactly what my body wanted; don’t laugh. Finding my way back to my bike was harder than I thought, but I managed it after a couple extra elevator rides, rolled it outside into the cold, stripped everything off of it, put it on my car, and climbed into the passenger seat for the trip to my hotel for the rest of the week. Other people have said that at the end of the Arrowhead, the answer to “would you do this again” is always “ask me in two weeks” but I was already on the side of “yes.” It was a hard ride and I was embarrassingly slow at an average speed of 3.5 mph, but I made it from one end to the other of what is widely considered one of the hardest races in the world. In the days leading up to the race, I had consoled myself in advance with the knowledge that just by being accepted, I was in an elite group of athletes who had accomplished amazing things. At least one had climbed Mount Everest, another had swam the English Channel (and DNF’d the Arrowhead 7 years in a row). So if I finished before I reached the finish line, I had still accomplished something great just by showing up. Finishing as the 5th from last cyclist to cross the line and in the half of cyclists who did cross the line rather than dropping early, was a strange sensation of accomplishment I really couldn’t properly appreciate at the time. Now...do I go for Order of The Hrimthurs? Hydration pack remained usable except for the very beginning. Cashews and sour patch kids in the same bite. Do not recommend! Back-up water would have been inaccessible after one use. Need to wax threads. Reese’s minis. They were really good and then suddenly gross, but they got me through to surly. Too much gear; bike too heavy. Pushing up those hills was not fun. Namakan ruff! I could move it to another jacket when my zipper failed. I packed my paniers by “new clothing”/”clothing changes” and couldn’t remember a) which bag was which and b) how things got categorized. Tire pump lock lever froze in place from too much moisture in/around trunk (maybe that’s why people have those screw-on pumps? Need insulated pouch for garmin/phone with hand warmer inside. Spend way too much time dicking around with the garmin to warm it up after the “critically low temp” shutoff and it wasn’t easy to take pictures. Right pinky, 3rd finger, and thumb have some numbness. Probably due to elbow stress. Right knee really rough, but expected. Needed to keep on top of my emergency inhaler. Coughing for days after.